Details: Beige Chiffon top embroidered on Neck and hem/daman using tilla, threads, sequins, beads and swarovski crystals. Lehnga: Beige chiffon lehnga embroidered on bottoms with large floral and geometrical motifs using turquoise threads, tilla, sequins, beads and swarovski crystals. Dupatta: chiffon dupatta large floral motifs embroidered on dupatta pallus and sequins and beads borers embroidered on borders of dupatta. Finished with turquoise pipin. Details: Banarsi silk top appliqued on neck in Golden and embroidered on neck, and shirt hem, and sides front back with colorful beads and threads work. Medium sized multi color beads danglings on the sides of the top. Lehnga: Self jamavar golden lehnga has embroidery on front and back. Embroidered borders on bottom and large floral wine embroidered on contre of front and back of the lehnga. Dupatta: Softsilk organza dupatta have large floral embroidered motifs on borders and sequins and beads diagonal lines all around mid. Embellishments: are done using lot of bead works followed by sequins and swarovski crystals, tilla and kora. Burnt orange & Magenta Lehnga. Details: Pure Banarsi top in Burnt orange color, embroidered on neck and hem/daman. neckline is embroidered with embroidery around neckline and and large motif embroidered below neck line. Thin embroidery line is embroidered on hemline /daman and goes all over side slits, three large embroidered motifs embroidered over embroidered hemline. Finished with magenta banarsi pipin. Lehnga: wide lehnga in chiffon had embroiery all around. Embroidered floral motifs implemented all around lehnga with sequins and beads lines. Bottom of lehnga is embroidered with sequins, and beads lines running all around. Finished with burnt orange pipin. Dupatta: chiffon dupatta in Magenta finsihed with burnt orange banarsi pipin, embroidered on borders and all around mid of dupatta. 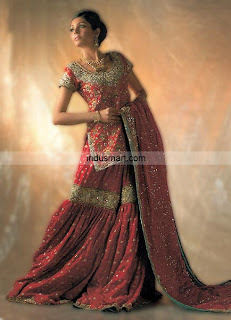 Pakistani Bridal Lengha: Fine kundan, sequins, beads, diamantes, and stones work. Blouse: is made with katan silk/ net fabric. Dupatta: is made with net. Lehanga: is made with katan silk fabric. 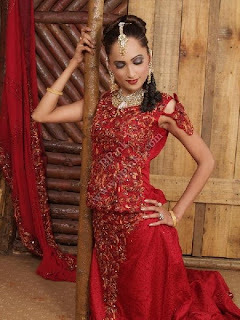 Pakistani Bridal Lengha: Fine dabka, sequins, stones, beads and cut dana work. Blouse: is made with net / katan silk fabric. Lehanga: is made with net/ katan silk with heavy work. Details: Pure Crepe silk top in deep red color heavily embellished on neck, sleeves and hem/daman and side slits. Hemline has golden applique fully embellished , small embroidered motifs all around the top. Finished with turquoise Banarsi Pipin. Lehnga/bottom: Pure Crepe Silk lehnga has 6-7 inch golden applique embellished with thick embroidery followed by silver worked border. Full floral jaal embroidered on lehnga over borders and small floral motifs embroidered all around top of the lehnga. Finished with turquoise Banarsi pipin. Dupatta: Deep red heavy chiffon dupatta has golden applique and embellished with thick embroidery on all four sides followed by silver embrodiery on top of first border all around the sides of the dupatta. Finished with Turquoise Banarsi Pipin. Embroidery: embellishments are done using kora, threads, crystals , sequins,beads, tilla and threads with clean and neat embrodiery stitches. 100% pure silks used. Details: Pure Banarsi shirt in deep red, appliqued on sleeves and hem/daman. embroidered with fine zardozi work on neck, sleeves and hem/daman using sequins, kora, beads, threads,and crystals. Banarsi pattern is also highlighted with the embroidery on full front. Shirt hem is appliqued in light turquoise and golden and embroidered. Sleeves are appliqued in light turquoise and embroidered. Sharara: Pure self jamavar sharara\Lehnga, appliqued on bottom in golden and light turquoise and embroidered heavily. Large floral embroidered bunches running upwards from bottom borders and fine zardozi embroidery Jaal on full lehnga. Dupatta: Banarsi chiffon dupatta appliqued on borders in golden and turquoise and embroidered. Finished with turquoise pipin on edges. Details: ivory color banarsi front open top embroidered on full front. thicker embroidery on neckline and on hem/daman , banarsi pattern highlighted with hand embroidery. Finished with purple pipin. 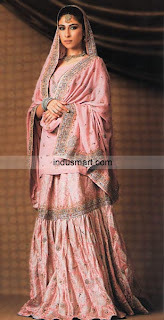 Gharara: top portion of lehnga is of Banarsi Silk, and bottom part is of Banarsi chiffon. embroidery on gharara joints/Gott and bottom of gharara. Dupatta: chiffon dupatta embroidered on borders & small floral motifs embroidered all around. Finished with Purple Banarsi pipin. Embellishments:embrodiery done using, kora, tilla, beads, sequins, swarovski crystals. 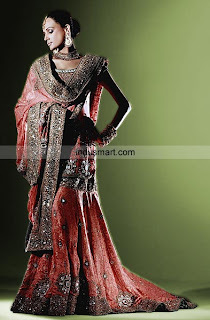 Pakistani Bridal Lengha: Fine sequins, beads, stones, and dabka work. Blouse: is made with katan silk fabric. Dupatta: is made with jamawar fabric. Lehanga: is made with jamawar fabric with heavy hand embroidery. Details: Light Grey & sea green chiffon top fully lined with silk, bottom of shirt is green. 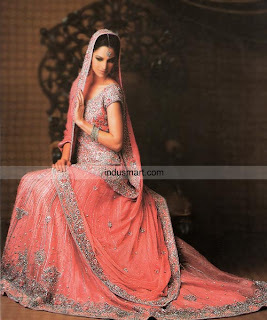 Embroidered on full front using peach threads, silver sequins, tilla, kora, and swarovski crystals. Finished with peach banarsi pipin. Lehnga: Self Jamavar flared gharara , embroidered on knee joints and borders on the bottom of the gharara, and also Embroidered motifs embroidered over the border. Dupatta: chiffon dupatta in light grey appliqued with sea green fabric on borders and embroidery over it. Small floral motifs embroidered all over mid of dupatta. Details: Pure crepe silk top in Light pink color embroidered on neck, and sleeves and small embroidered motifs embroidered all around. Gharara: Self Jamavar Gharara in Light Pink embroidery borders on gote (joints above) and small embroidered motifs all around gharara. Dupatta: Chiffon dupatta in Light pink embroidery all around 4 borders of dupatta and small embroidered motifs all around dupatta..
Pakistani Bridal Lengha: Fine lace, stones, sequins, kundan, dabka, and sea shells work. Blouse: is made with katan silk fabric with heavy work. Dupatta: is made with chiffon jamawar with full heavy work. Details: A Royal traditional bridal lehnga in orange, top is of chiffon fully lines with pure silk, appliqued on neck and hem/daman in dark green and embroidered with very fine ornamental zardozi hand embroidery using round crystals, pearl shaped beads, rhine stones, kora, threads, sequins and beads etc. small floral embroidered motifs all around top., finished with red pipin on neck, sleeves and hem/daman. Lehnga: Chiffon wide lehnga in orange fully lined with pure silk appliqued on bottom in dark green on front and back. Heavy embellishments on bottom in floral and geometrical pattern. Floral motifs embroidered all around lehnga. Finished with red pipin on edges. Dupatta: chiffon dupatta embroidered similarly on borders as on lehnga bottom and floral motifs embroidered all around dupatta. Embroidery: embroidery is done very neatly using large crystal stones, pearl shaped beads, swarovski crystals, beads, sequins, kora, threads etc. Embroidery type is zardozi and embroidery pattern is floral and geometrical. Details: top in self jamavar top has diagonal side slit covered with inlay. 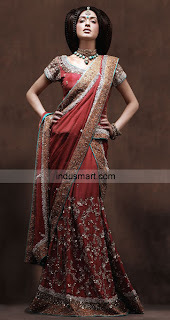 Embroidery on full front, large embroidery motifs with crystals in mid implemented on front. Finished with sea green pipin on neck and hem. Lehnga: Pure jamavar golden zarri weaved lehnga full of artistry in use of embroidery , and embroidery pattern. Large paisley aplliqued in pink and embroidered all around mid of lehngas. Mid bottom part of lehnga is covered with embroidery in geometrical diagonal shapes and round circles. Bottom is bordered with golden embroidery and filled with floral motifs and pearl shaped beads. Finished with shocking pink pipin. Dupatta: Sea green Banarsi chiffon dupatta has embroidered border similar to bottom on lehnga and small floral motifs all around. Finished with shocking pink pipin. Embroidery: 100% hand embroidery, done using turquoise and large crystals stones, with kora, threads, swarovski crystals, sequins and beads. Details: Pure Self Jamavar top has Boat neckline, embroidered on neck and hem (daman) of the top. Embroidery is done on neckline and large motifs below neckline, Hem(daman) of the top is embroidered heavily. Large embroidery motifs embroidered on hem/daman with large crystals implemented in them. Finished with bottle green banarsi pipin. Bottom: Pure Self Jamavar Gharara has trail at the back, embrodiery heavily on bottom with thick embroidered border around 8 inches running all around and Large embroidered motifs implemented over the border. Another embroidered border on gote of the Gharara. small embrodiered motifs implemented all around with large crystals inside motifs, Finished with Bottle green Banarsi pipin. Dupatta: Self Jamavar chiffon dupatta has heavy embroidered borders all around the dupatta, large embroidered motifs implemented over the borders and small embrodiered motifs all around mid of the dupatta. Embroidery: this bridal outfit has 100% Zardozi hand embroidery, materials used are swarovski crystals, sequins, beads, threads, Kora, till and naqshi etc. Details: Self Jamavar top in pink, round neckline hand embroidered on neck, sleeves and on daman/hem and side slits. Embroidery done using Rhine stones/crystals, kora, tilla, rafia , sequins and beads. Crystals are extensively used in embroidery. Finished with red banarsi pipin. Lehnga/Gharara: CHiffon flared ghara embroidered on bottoms and floral embroidery all around gharara. Finished with red banarsi pipin on bottom. Dupatta: Chiffon dupatta in pink heavy embellishments on borders all foursides and floral motifs embroidered all around dupatta. Finished with red baanrsi pipin. Details: Pure crepe silk top embroidered on full front in floral Bail with delicate zardozi hand embroidery on full front and sleeves. Lehnga: Pure chiffon Lehnga fully lined with silk, has back trail. Heavy embroidery on bottom of lehnga with two borders and large embroidered motifs over the borders. Embroidered vertical lines going top all around lehnga. Small embroidered motifs all around Lehnga. 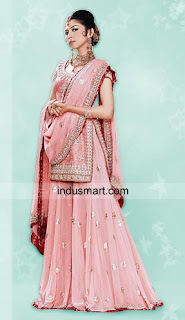 Dupatta: Chiffon dupatta in Pink has thick embroidered borders on all four sides and small embroidered embroidered all around and embroidered lines. Details: Red Banarsi top , round neckline and short sleeves, embroidered on full front wuth heavy embrodiery on neck and shirt hemline. Gharara: banarsi silk loose flared gharara, appliqued in golden on knee joints and embroidered. Embroidery is also done on bottom of gharara, small motifs embroidered all around gharara Finished with turquoise pipin on bottom. Dupatta: Banarsi chiffon dupatta red embroider on borders and sequins spray all around. Embroidery: is done using kora, threads, sequins, beads and swarovski crystals. 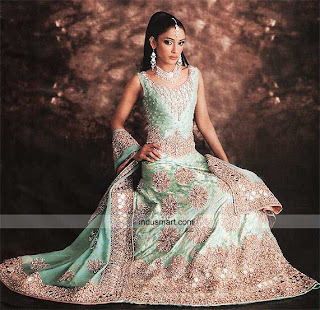 Pakistani Bridal Lengha: Fine dabka, sequins, and thread work. Blouse: is made with jamawar fabric. Dupatta: is made with grippe silk with crown. Lehanga: is made with jamawar fabric with tail and heavy work on it. Details: Red crepe silk top appliqued on neck in Rust colour embroidered on neck, bust line , shirt hem/daman, and sleeves. Heavy embroidery below neck around bust line, and shirt hem. Lehnga: in rust crepe silk wide at bottom, heavy embroidery on bottoms and middle, small floral embroidered motifs running all around lehnga. 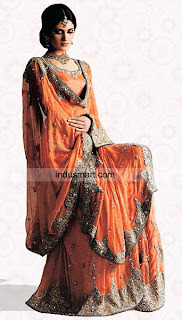 Dupatta: Chiffon dupatta in rust, heavy embroidery on borders and small floral motifs embroidered all around dupatta. Embellishements: are done using, sequins, beads, tilla, swarovski crystals and threads. Details: Self Jamavar top, round nec, drop waist bottom, embroidered on neck, sides, and hem/daman. On neck it is worked with large crystals and kora, sequins and beads, and on daman top is worked in kora, naqshi, sequins and beads. Finished with golden banarsi jamavar pipin. Lehnga: Banarsi Jamavar Lehnga in turquoise, heavily embellished bottom and large ornamental motifs all around lehnga. 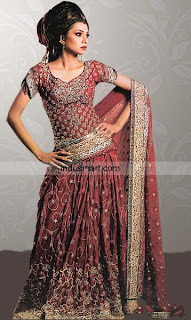 Border of lehnga is worked in kora, sequins, beads, crystals, triangular mirrors etc. Finished with golden banarsi pipin. Dupatta: chiffon dupatta heavily embellished on borders and large ornamental motifs embroidery all around. Embroidery: top has large almonds shaped crystals work on neck area, one of lehnga and dupatta border is worked in triangular mirrors borders. Rest of the work is done with swarovski crystals, sequins, beads,kora, tilla and naqshi. Color tone is antique gold and silver with mediumcopper shades as well. 100% zardozi hand embroidery. Details: Crepe silk lehnga top, embroidered on neck, and shirt hem heavily. finished with pink banarsi pipin on neck, sleeves and hem. delicate zardozi hand embroidery done on neckline and hemline, large floral & geometrical motifs embroidered in mid and over the hemline. Gharara: Pure Crepe Silk flared gharara, embroidered on knee joints with zardozi hand embroidery , and bottom of gharara is heavily embellished with embroidered borders and large embroidered motifs implemented over borderline. Finished with pink banarsi pipin on bottom. Dupatta: dupatta in silk with self striped, have heavy embellishments on borders all around border and embroidery lines running all around mid. Finished with pink baanrsi pipin. Embroidery: is done with zardozi hand embroidery using swarovski crystals, sequins, beads and kora, and threads. 100% hand embellishements, and 100% pure silk fabric. Details: An elegant and modern bridal lehnga, embroidered on full front, heavy concentration of embroidery on neck and shirt hem/daman. Embroidery done using sequins, beads, threads, swarovski crystals. Lehnga: turquoise lehnga has a train on back, embroidered motifs running all over. Thick embroidered border at the bottom and large florals embroidery over borders. Dupatta: pure heavy chiffon dupatta has very thick embroidery on borders and floral embroidered wine running over border. Small floral embroidery all over dupatta. Embroidery: done using sequins, beads, swarovski crystals, threads, naqshi etc.